The constant cloudy days and drizzly sky have finally caused the temperature to plummet. The air is damp and cool, even by First Day of Autumn standards and my green smoothie run has come to an abrupt halt for want of a warmer breakfast. 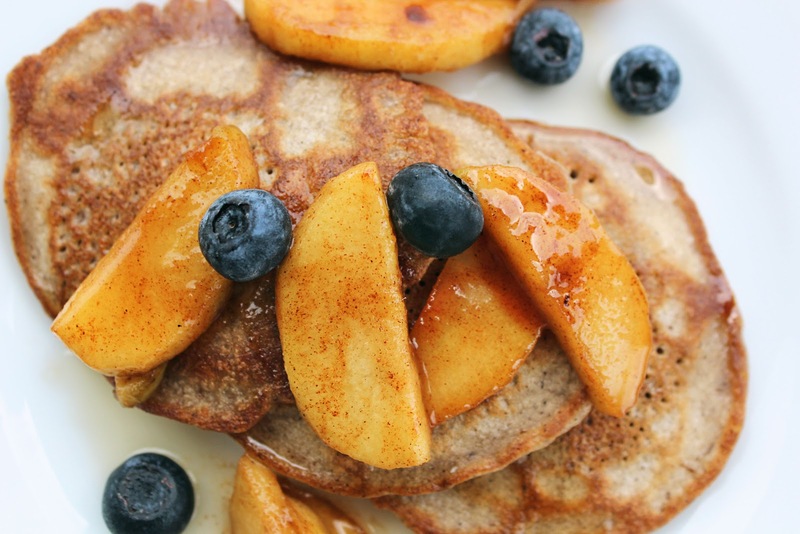 What better way to celebrate our new season than with glorious, golden buckwheat pancakes. 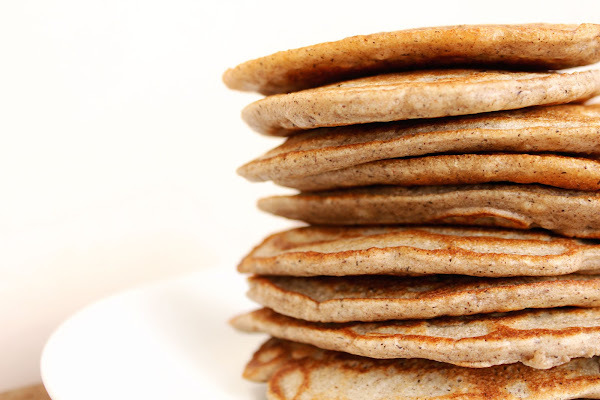 You may recall that I have shared a similar buckwheat pancake recipe in the past. 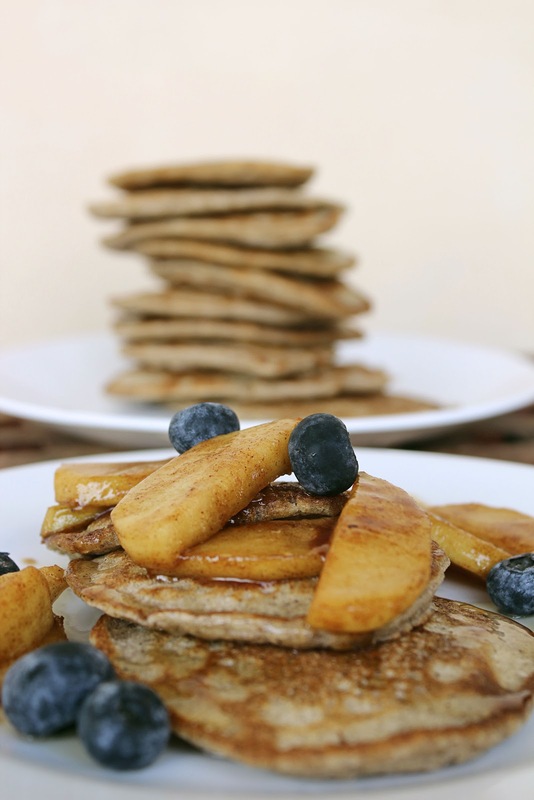 Those pancakes were covered in sweet, ripe bananas, golden honey and flaked almonds. The recipe for those beauties can be found here. I've since created a new recipe and these pancakes my dear, dear friends will. Blow. Your. Minds. Fresh blueberries and additional maple syrup to serve. To make the pancakes, sift the flours and baking powder into a large bowl, make a well in the centre, add the eggs and mix. Pour in the milk in a slow stream and whisk the mixture until you have a uniform batter. Heat a heavy based pan over medium heat. Pour in a generous amount of olive oil (glug, glug, glug! )and when the oil starts to move (it looks magical as it heats), ladle or pour roughly 1/2 cup of the batter into the pan. I love to make small, round, odd shaped pancakes that are oval in appearance; in a large pan you can easily fit three or more pancakes. 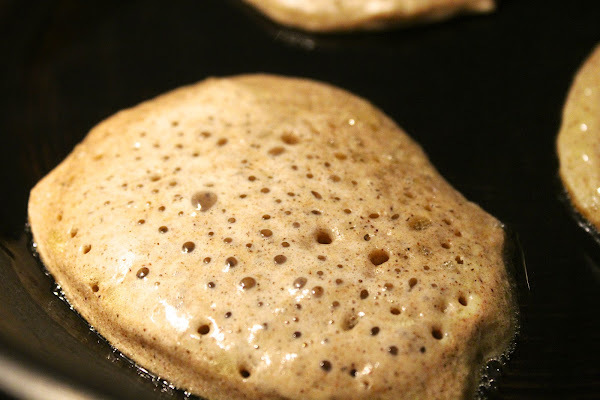 Allow the pancakes to cook until small bubbles form on their creamy surfaces. As the bubbles begin to burst, flip the pancakes and continue cooking for another minute or less. When making a large quantity of small pancakes, it's helpful to keep your growing mound in a warm oven as you finish cooking the batter. When they're ready to be served, rearrange the golden discs into an impressive stack to stand as a proud tower on your table. To make the cinnamon apples, peel, core and slice the apples. Drop the butter into a hot pan and as it bubbles and hisses, add the apple slices and cinnamon. Lower the heat and cook the apples until the butter absorbs into the fruit, stirring occasionally. Pour in the water to soften the apples, add a splash of maple syrup to sweeten and reduce until the sauce thickens and becomes glossy. Serve hot over the golden buckwheat pancakes. 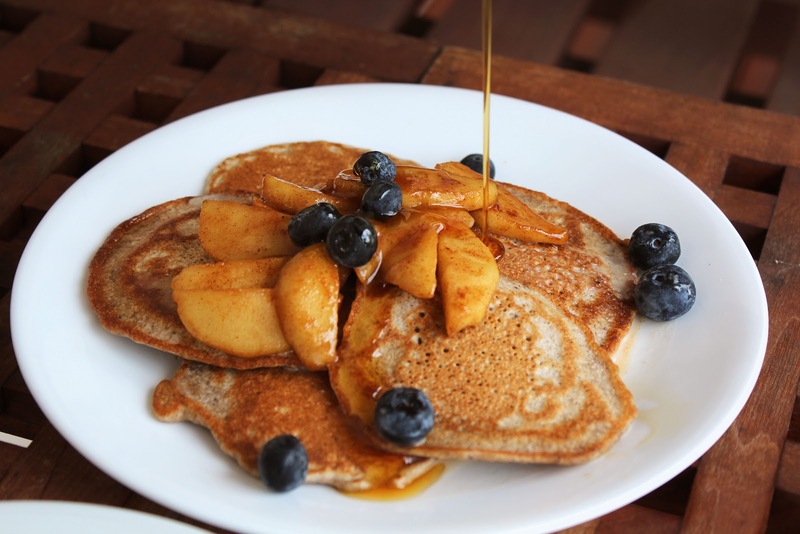 Sprinkle with fresh, sweet blueberries and highlight with a stream of honey-coloured maple syrup. For me, there is nothing more comforting on a cold, dreary morning than biting into soft, warm pancakes, topped with sweet cinnamon apples and fresh violet pearls, bursting with blueberry sweetness. How do you serve your pancakes? I used to be a lemon and sugar girl when my mother made large, thin pancakes for us when I was in primary school. She would flop the steaming pancake on the plate, squeeze the lemon and I'd sprinkle it with sugar before rolling it up like a crepe. Wonderful memories! I hope you have a great weekend too! Mine too Alice! Do you have little ones like these or great big ones that roll up? This has me drooling! Looks amazing! We will definitely have to try this! Have a great weekend, Bella! Thank you Victoria. These are a treat to have on a cold morning. Cross my heart I don't eat pancakes every day! It makes them a special treat. YUMMO! These look so good, Bella! My favourite topping has always been lemon & sugar, whereas Sam loves berries & maple syrup or even Nutella for those 'naughty' mornings, so there's always plenty to choose from! Ohh when I was in Venice I had a crepe with Nutella and sliced bananas. They made it on a large round hotplate and folded it into quarters to serve. I walked around in the dead cold of a wintry night with new friends I had met backpacking with our nutella crepes on paper plates, keeping our fingers warm.